Heir to the Baronetcy of Ballentaylor, Mr Osborne has a degree in history and has never had a job outside of Westminster politics. An intellectial giant? No. George Osborne, the Prime Minister’s closest political ally, has been confirmed as our Chancellor. As part of the coalition deal with the Liberal Democrats, Vince Cable will be playing a significant supporting role with a specific focus on business and the thorny issue of banks. The key question for the country is whether this team is capable of managing the economy through one of the most difficult periods in British history. On personality, the differences are clear. A grammar school boy educated at Cambridge, Dr Cable has a PhD in Economics and has lectured on the subject at the London School of Economics. Having worked in Africa as a Treasury adviser, he published a number of academic papers whilst gaining high profile private sector experience as Chief Economist to Shell. Heir to the Baronetcy of Ballentaylor, Mr Osborne has a degree in history and has never had a job outside of Westminster politics. It is clear who carries more intellectual weight. And the Lib Dem’s hard-line position on capping bankers’ bonuses may be hard to swallow for a Prime Minister who trumpets ‘the City is in my blood’. The Chancellor also suggested, pre-election, that shares in publicly owned banks could be sold at a discount to small investors as a way to recapitalise the poor. The ridiculousness of this proposal was pointed out not only by this blog, but by Dr Cable himself, who at the time suggested that the plan “beggars belief”. Last year Cameron pledged to abolish Regional Development Agencies, with Eric Pickles stating that ‘RDAs are unaccountable, unelected and they will be abolished”. In contrast, the Liberal Democrats’ “Fair and Sustainable Economy” release fronted by Dr Cable and the new Deputy Prime Minister, pledged to take economic regionalisation even further, putting in place both ‘local enterprise funds’ and even regional stock exchanges. 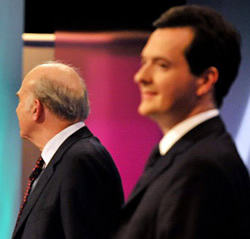 The Chancellors’ debate before the election highlighted the many differences between Dr Cable and Mr Osborne, not least on the management of the economy. Calling Mr Osborne’s proposals to rely on efficiency savings to halt the rise in National Insurance “utterly incredible”, Dr Cable also referred to business support for Mr Osborne’s pet policy of an NI tax cut “nauseating”. Today we are beginning to see how this uncomfortable arrangement will operate. A centrepiece of the Tory reform plans was to disband the Financial Services Authority, placing its responsibilities in the keep of the Bank of England. It appears this morning that the Chancellor has backed down on this costly, apparently pointless policy, under pressure from the Liberal Democrats. In return, Dr Cable has entirely reversed his position on the timing of cuts in public spending, today arguing that in the last two weeks a number of factors have convinced him that the Tories were right in the first place. This quite astonishing volte face is in sharp contrast to the straight-talking, honest politician he has previously presented himself as. Coalition government of this nature is new to all of us. Compromises will have to made across a range of policy issues – and most importantly on the issue of the economy. Keeping the inexperienced Tory economic team in check will be a welcome result. However progressives in this country – many of whom wholeheartedly accept the rationale for a stable Con-Lib pact under current circumstances – do still expect the Liberal Democrats to act with principle and decency. If what we end up with is Nick Clegg pretending to support ill-thought out Tory economic policy from the despatch box in gratitude for the granting of a referendum on the electoral system, then the laudable stance of acting in the national interest may well begin to unravel. Right..so the country can go to hell, but you guys will hope and pray for a disaster. Nice. Get real. “Dr.” Cable has changed his mind so many times it is amazing how he remembers his last position. He was happy enough to sign up for the 6bn cuts as well, right? Gordon Brown says he worked for the country, but all he did for the first 10 years was to try and bring Blair down. Was that in the country’s interests? We could’ve achieved so much with that majority, esp. considering the amount of money Labour has spent (and borrowed) so far. Osborne would win in a fight. Interesting how Mervin King agree’s with the cuts immediately. Let’s wait and see just how bad the books *really* are and when the cuts come the government will just blame Labour. Some of the writers on this blog need to realise Labour lost the election and in my not humble opinion a lot was by silly partisan tribal responses to events which clearly begged belief. With all of this talk of “New Politics” and other drivel all continued stupidity and na na na na naaa nahhhh articles will just alienate potential voters even further. Look at the numbers – Labour has 251 seats and a comeback is possible in five years but not if the left continues with these negative articles. Like the Tory Toffs stuff they don’t work. Have you guys learned nothing? memories are so short lived in politics,as we ahve ALL witnessed when it suits weak people disloyal people jump ship.people forget where mr clegg learn’t his political rise with the guidance of two tories back in the day.we are now in the GREY AREA of policies because we cannot deny the fact that idelology policies have been discarded for power gain.i worry what else will be discarded in the pursuit of ultimate power.is that the BIG SOCIETY WE SHOULD EXPECT,should we be pessemists or optimists?your call and finalyy is this new party called CONDEM(all)NATION PARTY?